Trailhead and parking area are at the end of Alton Mountain Road in Alton, NH (summit is in Gilmanton). To get there, take Rand Hill Road from the west side Rt. 11, 0.1 miles west of Rt. 28A. Drive 0.7 miles on Rand Hill Road, then turn left onto Alton Mountain Road. Continue 3.1 miles to the end of the road in a clearing. Just before it ends, it turns into a rough dirt road. Park at the end of the clearing. Mt. Anna is a small hill in the Belknap Range. 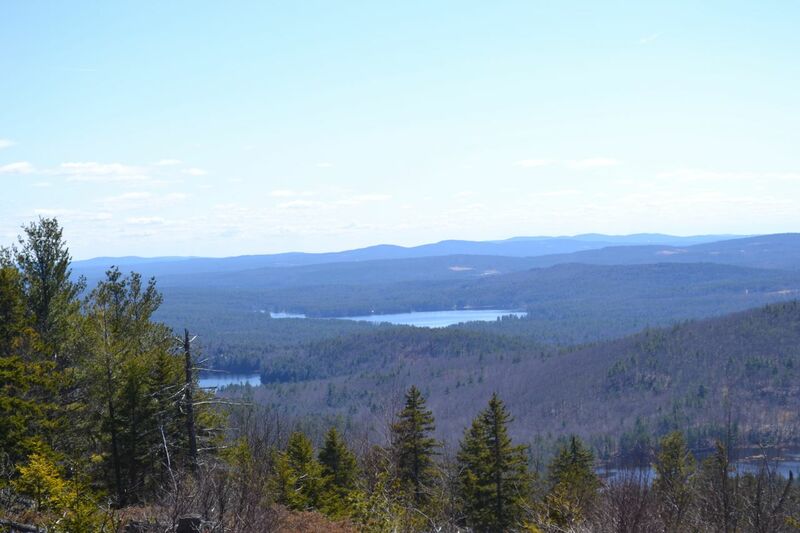 Its view can't be compared to the panoramas of the more popular mountains in the range like Belknap Mountain and Mt. Major, but it is a pleasant hike and there are no crowds. The hike begins on a snowmobile trail (Old Stage Road). Facing the parking area, turn left (west) and follow the wide dirt path into the woods. You will see a sign for snowmobile route 22W. A gradual half mile descent brings you to a pond with a view of Straightback Mountain. At the end of the pond, the trail splits; follow the right fork. It then climbs onto a small hill, where a smaller path diverges to the right. Bear left and continue on the main snowmobile trail for 0.2 miles, ignoring any more branching paths, then turn right onto Anna-Goat Trail. Look for the wooden post and red trail markings. After this, immediately bear left as Precipice Path diverges to the right. The hiking trail crosses a brook and begins a moderate climb. After a 0.4-mile ascent, a spur on the right leads to Carbonneau Cave, a small rock crevice at the base of an impressive cliff. The main trail continues uphill to another brook crossing, then begins to climb much more steeply. The grade eases as you near the broad top of the mountain. Just below the summit, the trail enters an area of bare rock and becomes overgrown with bushes. Cairns lead to the summit, reached in 0.6 miles from the cave, where there is a very limited view. At the four-way junction on the summit, turn left onto Anna-Old Stage Road Link (Blue Trail). This trail descends from the summit, passing a small pond before emerging on a sunny, south-facing ledge in 0.2 miles. From this ledge, there is a good directional view. There are small hills and lakes (Hills Pond, Sunset Lake, and Manning Lake) in the foreground, and several mountains on the horizon. Catamount Mountain, Nottingham Mountain, and Fort Mountain are in the distance on the far left. In the center horizon are the Uncanoonuc Mountains and Joe English Hill. To the far right are Mt. Watatic (Massachusetts), the Wapack Range, Crotched Mountain, and Mt. Monadnock.